Washington can and does use its "jihadi" #mercenaries wherever Washington pleases. Washington has deployed these terrorists in Afghanistan, Libya, #Syria, Iraq, Iran, Yemen, Bosnia, Kosovo, and beyond. Sometimes assets/proxies are not aware that they serve Washington "interests", but they are still proxies nonetheless. 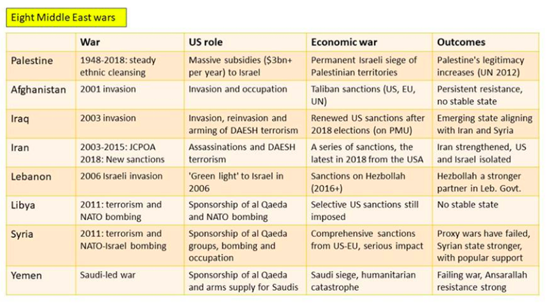 Washington seeks global hegemony, hence, it imposes destabilization/destruction" strategies on non-compliant nations. Terrorist proxies are excellent instruments for destruction, and they play a central role. "Islamic State in Iraq and the Levant (ISIL), a having been defeated militarily in Iraq and most of the Syrian Arab Republic during 2017, rallied in early 2018. This was the result of a loss of momentum by forces fighting it in the east of the Syrian Arab Republic, which prolonged access by ISIL to resources and gave it breathing space to prepare for the next phase of its evolution into a global covert network. By June 2018, the military campaigns against ISIL had gathered pace again, but ISIL still controlled small pockets of territory in the Syrian Arab Republic on the Iraqi border. It was able to extract and sell some oil, and to mount attacks, including across the border into Iraq." The culture that Western-supported terrorists impose on occupied areas of Syria is largely foreign to Syria and the Levant. Women, for example, must dress in black abas, in accordance with #Sharia law. Clearly, the notions that Canada and its allies seek to impose "democracy and freedom", or that their "regime change" wars of conquest are "humanitarian", are absolutely ridiculous. 1. R and U Videos, "War Diary Project". ( https://www.facebook.com/timand2037/videos/10215310579850700/) August 2018. Accessed 19 August, 2018. 2. "Twenty-second report of the Analytical Support and Sanctions Monitoring Team submitted pursuant to resolution 2368 (2017) concerning ISIL (Da'esh), Al-Qaida and associated individuals and entities." 27 July, 2018. (http://undocs.org/S/2018/705). Accessed 19 August, 2018. 3. Whitney Webb, "UN Report Finds ISIS Given 'Breathing Space' in US-Occupied Areas of Syria." Global Research, August 16, 2018, MintPress News 15 August 2018. (https://www.globalresearch.ca/un-report-finds-isis-given-breathing-space-in-us-occupied-areas-of-syria/5650819) Accessed 19 August, 2018.